In the underworld, Osiris sits in his throne, where he is praised by the souls of the just. If a person says to Osiris "I have not stolen and I have not lied", then he would decide if he/she had directed a respectful life. All those who pass the tests of the underworld become worthy to enter The Blessed Land, the part of the underworld that is like the land of the living, but without sorrow or pain. 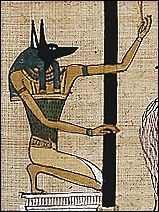 Anubis, who was the original god of the dead before Osiris took over, became the god of mummification and of the underworld. He watches over mummification processes to ensure that no mistakes are being made. He also conducts souls through the underworld. After being interrogated, a person's heart is weighed on a scale called the Scales of Justice. If honest, the person is granted a safe passage to the afterlife. The hearts of the dishonest are eaten by the goddess known as the Devourer of the Dead, who is part crocodile, part lion and part hippopotomus. This overweight bearded dwarf who is the protection of childbirth is not Egyptian at all. During the birth of a child, Bes would dance around the room, yelling to frighten away evil spirits who might put a curse on the child. After the baby was born, he would entertain the child. It was believed that whenever a child laughed, Bes was somewhere in the room. Also known as Bast or Ailuros, Bast the moon goddess is the second most well-known Egyptian goddess. To those who are kind to her, she gives blessings. Although, she is sometimes listed as the goddess who punishes those who are sinful. One creature Bast would never dream of harming is a cat, because they are sacred to her. Click here for a chart that shows how each of the Egyptian gods and goddesses are related!!! This great god of wisdom is unusual. Some people say he created himself through the power of language. He is the inventor of magic, creator of music and the messenger of gods. He questions the dead's souls about their deeds in life before their heart is weighed against the feather of Maat. He is also the great counselor and the other gods often went to him for advice.